Designed for use with compatible Lafayette Instrument Company Evaluation systems, such as the Jackson Strength Evaluation System, Digital Hand Dynamometer, LEval provides a wireless connection between a device and a tablet. This connection allows for simple test setup and consistent administration. 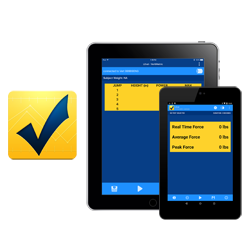 Subject testing data can be conveniently stored on the tablet for data analysis and easy access to historical charts. With simple controls and an increasing number of compatible devices, LEval will improve the organization and efficiency of patient care or pre-employment testing. LEval is available for download from Google Play and the iOS App Store.